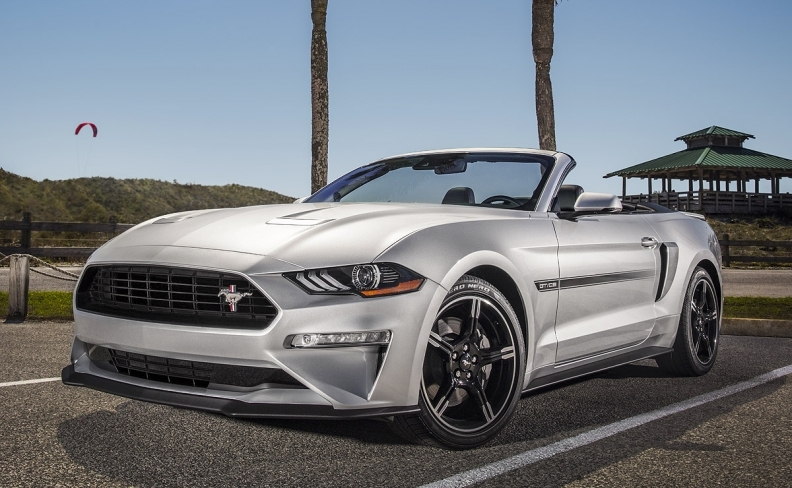 The California Special includes the Mustang's 5.0-liter V-8 mated to a six-speed manual transmission and will get 460 hp and 420 pound-feet of torque. Ford Motor Co. said Monday that it will reintroduce the Ford Mustang GT California Special for the 2019 model year with unique badging, wheels, blacked-out grille and interior design featuring custom floor mats and seats. It will be sold in Canada. The special edition pony car going on sale this summer is a tribute to the first California Special, based off a 1967 Shelby GT notchback coupe prototype. "Few things are more satisfying than dropping the top on a California Special and taking a drive down the majestic Pacific Coast Highway," Mark Conforzi, Ford designer, said in a statement. "This signature design takes its cues from the original California Special, while enhancing the personality of today's Mustang." Ford has produced special edition Mustangs on a number of occasions, most recently for the 2016-17 model years. The automaker also is reviving the special edition Mustang Bullitt this year. The California Special includes the Mustang's 5.0-litre V-8 mated to a six-speed manual transmission and will get 460 hp and 420 pound-feet of torque. It can hit 250 km/h (155 mph) with an optional performance package. It also comes with options available on standard Mustang models, including a quiet start mode and customizable digital instrument cluster. Since its 50th anniversary redesign for the 2015 model year, the Mustang has dominated the muscle car sales charts. Through the first two months of 2018, sales are down 21 percent to 10,532, although it still leads rivals Chevrolet Camaro and Dodge Challenger. Ford did not release pricing information for the 2019 California Special.